^ 1.0 1.1 1.2 1.3 魏寿昆. 火法冶金. 中国大百科全书 第一版. ^ 2.0 2.1 2.2 2.3 Smelting. Encyclopaedia Britannica. [2018-08-15]. ^ Souckova-Siegolová, J. Treatment and usage of iron in the Hittite empire in the 2nd millennium BC. Mediterranean Archaeology. 2001, 14: 189–93. ^ 5.0 5.1 中国期货业协会编. 锌. 中国财政经济出版社. 2011-11-01: 48–55. ISBN 978-7-5095-3190-7. ^ 6.0 6.1 6.2 Ray, H.S. ; 等. 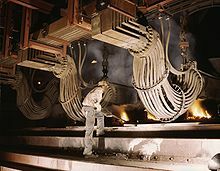 Extraction of Nonferrous Metals. Affiliated East-West Press Private Limited. 1985: 131–132. ISBN 81-85095-63-9. ^ Copper Metal from Malachite | Earth Resources (PDF). asminternational.org. [2015-08-26]. （原始内容存档 (PDF)于2015-09-23）. ^ George C. Wang. The Utilization of Slag in Civil Infrastructure Construction. Elsevier Science. 2016-06-24: 36–. ISBN 978-0-08-100397-8. ^ Hutchinson, T. C.; Whitby, L. M. Heavy-metal pollution in the Sudbury mining and smelting region of Canada, I. Soil and vegetation contamination by nickel, copper, and other metals. Environmental Conservation. 1974, 1 (2): 123–132 [2018-02-07]. ISSN 1469-4387. doi:10.1017/S0376892900004240. （原始内容存档于2018-02-08） –通过Cambridge University Press （英语）. ^ Likens, Gene E.; Wright, Richard F.; Galloway, James N.; Butler, Thomas J. Acid Rain. Scientific American. 1979, 241 (4): 43–51. JSTOR 24965312.